The gluten free adventures of Chef Atticus, in his kitchen and around Portland. This Saturday evening my mom and I are going to be vendors at The Winter Bazaar at The Arbor Lodge. 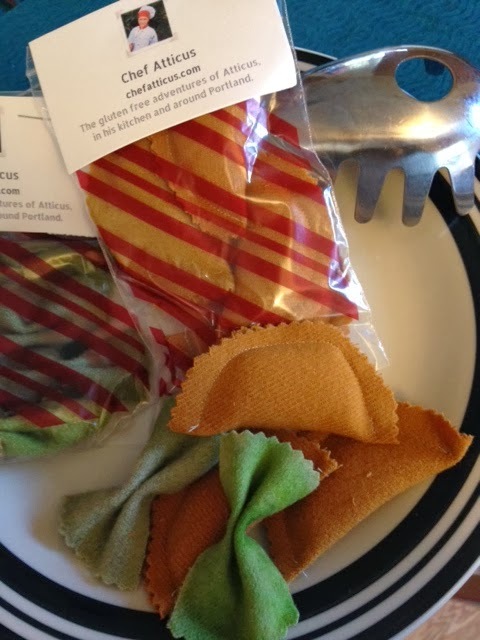 I made some felt play pasta for kids. I have "pesto farfalle" and "cheesy agnolotti". They will be on sale for $4.00 per package. I will also have some aprons for sale too! My mom is going to have her belts and dresses there too, and my sister will have a table as well. Come by and say hi if you are in Portland and buy some play pasta!